It’s not about your location, it's about the mindset. Here's how to get away, whether you have a week-long break or just a couple of hours. Your kitchen light bulb flickers and goes black (after you just replaced it’s counterpart last week). Your boss emailed another round of edits for you to make to this week’s report. You still haven’t scheduled that dentist appointment — nor answered that email about volunteering next week. And when you open your closet you realize it’s time to do laundry again. We’ve all (likely) been fed up enough with the routine daily grind — whether it be errands, chores, work, family responsibilities or any combination of the above — that we can relate to that “I need a vacation” feeling. “There’s this constant nonstop,” says Alexander Cailllet, an organizational psychology consultant and coach and adjunct professor at Georgetown University — explaining that the pace of work and other parts of our lives is only getting faster and faster in today’s world. And our brains and bodies aren’t built to work that way, he says. It wears us down, he says. And that’s why today more than ever we need to value time off — and take it. And take enough of it, he says. Time off means unplugging from the everyday drudge and engaging in something different that leaves you feeling refreshed and rejuvenated. But “vacation” doesn’t mean you need to fly to Europe or some tropical beach necessarily. The time off Caillet is talking about means unplugging from the everyday drudge and engaging in something different that leaves you feeling refreshed and rejuvenated. It might look like a two-week road trip, or it could be an afternoon hike, enjoying a good meal with interesting friends, or simply gardening for an hour in your backyard. “It’s about giving ourselves a chance to step out of the stress, calm down, rebuild and regain that sense of balance,” Caillet says. It’s about the mindset. Think back to the last time you completely lost track of time — when you were able to choose to do what you wanted to do in the moment. You weren’t worried. You weren’t thinking about what you had to do the next day. And you felt satisfied with whatever you were doing — and you weren’t questioning, judging, comparing or worrying that maybe you should be somewhere else or be doing something else. 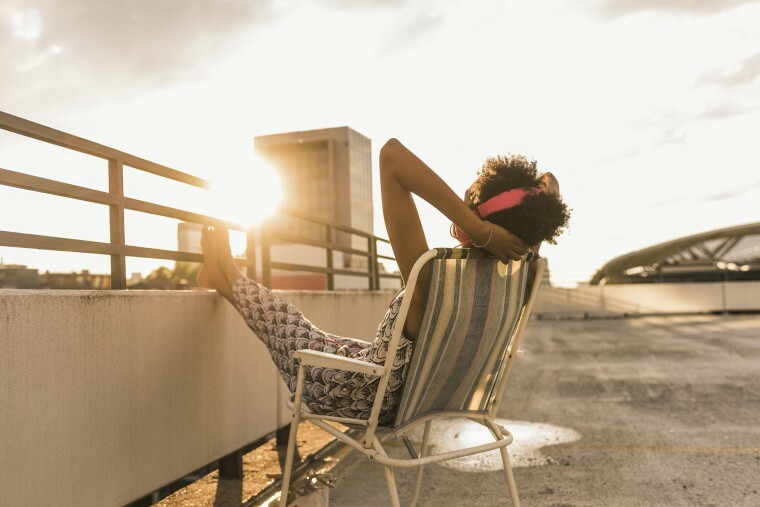 That’s the vacation state of mind, explains Brigid Schulte, director of the Better Life Lab at New America and author of the book "Overwhelmed: Work, Love, and Play When No One Has Time." “You feel okay with yourself and what you’re doing. And you’re giving yourself permission to be in the moment and let the moment unfold as it is,” she says. The unplugged mode is where your brain is freed up to have new ideas, fresh thoughts and make connections it wouldn’t otherwise. The “on” mode is where we get things done. The unplugged mode is where your brain is freed up to have new ideas, fresh thoughts and make connections it wouldn’t otherwise, she says. Neuroscience explains the down time mode (“default mode” in science speak) is when we have insights, and that it plays an important role in our psychological mental processing, reading comprehension, divergent thinking skills, and our ability to feel social emotions. Unplugging also gives you time to connect to your sense of self and to others — and take stock of the meaning you’re getting out of life, Schulte says. And getting in vacation mode is one way to get into that down time, daydreaming state of mind. This is where we could cite dozens of studies that illustrate the benefits of vacation and down time (such as research that shows having reliable and predictable regular time off improves job satisfaction, perception of work/life balance, intention to stay in a job and performance). But if you’re reading an article about how to get into the vacation mindset, you probably don’t need another reason why you want to. What is helpful to know is that evidence suggests you can actually get into that mindset really quickly. One study that looked at brain activity in individuals as they watched videos for entertainment showed that that “down time” brain mode could be activated in a moment with the blink of an eye. “It happens when you take a break from your day-to-day life, you focus on something else (whether it’s people, an experience or an adventure), and you engage in something different,” Caillet adds. You’re immersed in it and you’re curious about it, he says. One psychological model suggests that five components make leisure time leisurely: detachment from work, autonomy, meaning, mastery of a skill and affiliation. Another factor that you need to get you there, Schulte says, is having a sense of choice in where you are and what you’re doing (it’s not an obligation — you want to be there). And you need to feel a sense of control over time, meaning there’s not something else you’re watching the clock to rush off to. One psychological model of what makes leisure time leisurely suggests that five components help: detachment from work, autonomy, meaning, mastery (you’re overcoming a challenge or honing a skill), and affiliation (having a feeling of belonging or association). So how do you get to that state of mind? Remember: vacation does not any one specific location make. You could be on the most exotic and luxurious beach in the world and be stressing out about a work email your phone just alerted you to, feeling like you can’t afford the trip you’re on, or the fact that more of your friends haven’t liked your vacay Instagram post yet. Don’t be that wound-up vacationer. Here’s how to do your time off better. Whether you’re taking a month-long sabbatical or you just hired a babysitter to watch the kids and give you an afternoon off, start by deciding how you want to feel during that time off first, Schulte says. Then plan what you need to do (or might try) to get you there. Do you need alone time? Do you want to be in nature? Do you want to be active? Maybe you really just want a quiet afternoon to myself to read a book. Or maybe you want to plan a big dinner party with friends you haven’t seen in a while. Give yourself some parameters as to what “time off” means. Maybe it’s a week. Maybe it’s three hours. But determine that time frame and determine what you want to be inside and outside of that perimeter you set, Caillet says. Now that you’ve determined what you want your time off to look like and feel like, give yourself permission to go there and be with what’s in front of you, Caillet says. Don’t answer that text or that email or fit in that one extra task on your to-do list. Does unplugging mean you need to disconnect from social media, too? Not necessarily, Caillet says — but be judicious about it. Is it going to help you connect to, engage with and enjoy the experience? Or is it going to bump you out of the experience? Think of that song you can’t help but dance to. This is the time to blast it. Music dramatically affects our mood and energy, Caillet says. It can very quickly make us feel very happy or very relaxed or very excited. Food ignites taste and taste ignites smell. The vacation state of mind is a lot about reigniting the senses. Stop. Look around. Notice things. Listen. Taste. Touch. Be curious, Caillet says. One really straightforward way to be present, Caillet notes, is to make it a point to learn something new. If you’re with someone else, ask them a question. If you’re on a hike, notice what’s around you. What kind of trees do you see? What’s the trail like? “Get into it,” Caillet says.